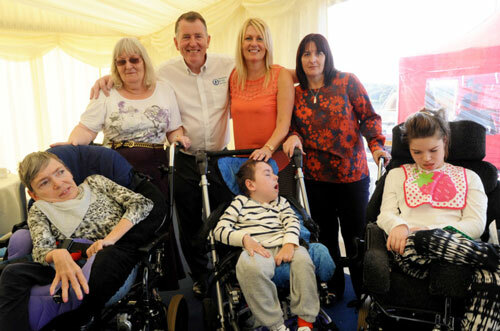 On September the 27th 2013 Specialised Orthotic Services celebrated 33 years of success. A Snooker Legend was on hand to help cut the ribbon and celebrate the opening of the new look production facility in Tutbury, Staffordshire. 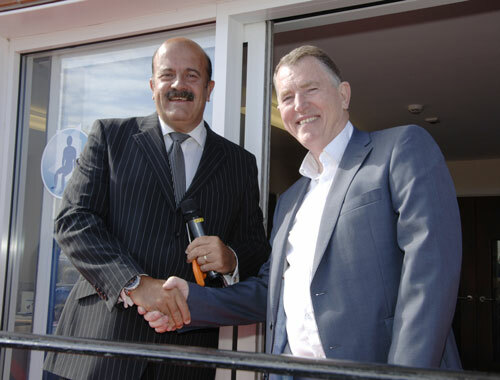 Willie Thorne helped founder and managing director Gordon McQuilton kick off a day of celebration with over 200 guests in attendance including long standing clients, staff and suppliers. For those of you too young to remember or unfamiliar with Willie’s work. Willie Thorne was a Snooker playing legend back in the day, after a successful career in professional Snooker, Willie has dedicated his time to helping raise money for charity and good causes. He has been a patron of Rainbows Children’s Hospice for the last 7 years helping raise over £300,000. Speeches were given by Gordon and Willie Thorne, followed by a moving speech by Maria Welch highlighting her experiences with SOS and how it has affected her life and her daughter, Becky Hanley. SOS would like to say a massive thank you to long standing clients Freya Smyth, Max Dunkley, Matthew Carter and Kim Wright (and parents) for making the long journey to us in Tutbury to show their appreciation for everything Gordon and SOS has done for them. Gordon was delighted and moved by the experience and were presented with presents as a sign of gratitude. This brought the end to an emotional recollection of the history of SOS and the amazing impact that our special seating has had on the lives of just some of our many clients. British manufacturing at SOS. Nearly everything we produce is made at our factory in Tutbury, UK. The upholstery department at SOS, hard at work covering seats and making P Pods. 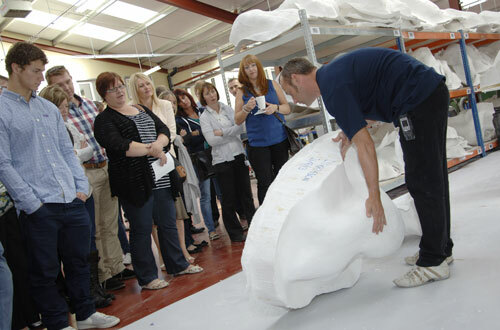 Guests were invited to take a factory tour to see the hard work that goes into making our custom moulded seating possible. This included a look at our latest technology including digital scanning and new product development. We are proud to be a British manufacturer. Nearly every component on our wheelchairs is made in house allowing us to offer fast turn around and exceptional quality products. Where possible SOS have supported local businesses by using suppliers from the surrounding area. 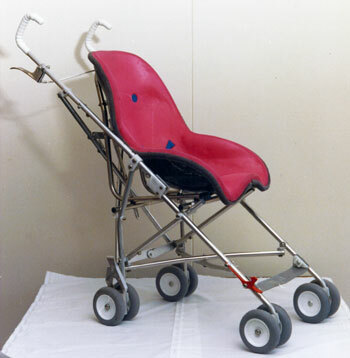 Specialised Orthotic Services is not part of a larger health organisation. The company was founded 33 years ago in 1980 by founder and managing director, Gordon McQuilton MBE. The company started in Gordon’s back garden, operating out of a shed, re-locating to Weston Upon Trent before moving to Unit E, Fauld Industrial Estate in Tutbury. SOS soon found its-self running out of space and after multiple building expansions re-located to the current location in 2001, Unit 127-128. Since SOS acquired the original warehouse and land, the 10,000 ft2 facility has been expanded repeatedly until we arrive at the current day with the opening of another large expansion to house our growing moulding department and expanding our upholstery facilities. The facility is now more than double the size it was in 2001, with mezzanine floors and land expansions to accommodate the company’s growth. The newly extended Specialised Orthotic Services building 2013. 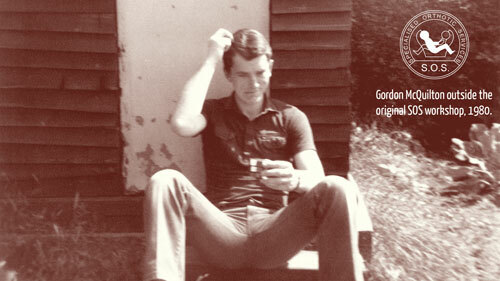 In the last 33 years Gordon McQuilton has guided and shaped the company from a one-man-band operating out of a shed in his back garden to a company operating throughout the UK with nearly 100 employees and a reputation for exceptional quality products and a fantastic reliable service. 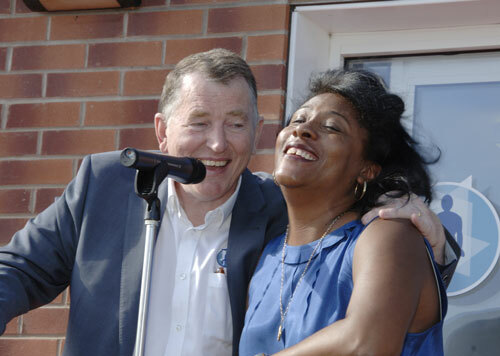 In 2008 Gordon McQuilton was invited to Buckingham Palace to be awarded with an MBE for services in special seating for disabled adults and children. The award was presented by Prince Charles. He said “I received the award not just for myself but also for all of SOS, all the people who have over the years contributed to it’s success”. We have added the photos taken on the day to our facebook page. If you would like any high resolution copies then please do not hesitate to contact us.